Burn WMV file to DVD/ISO/Blu-ray/BDMV folder. Standing for Windows Media Video, with a file extension of .WMV, WMV is a proprietary digital video container format of Microsoft that is majorly used for storing video files on Windows system. Playing your WMV files on Windows and other PC is simple, but if you want to enjoy these videos on a TV or home DVD player, WMV to DVD conversion is needed. Moreover, as you burn WMV to DVD, an organized backup collection of your needed videos is also created. Shown below are the best solutions to convert WMV to DVD. Among the list of available WMV to DVD converters, we recommend Wondershare DVD Creator as the software results in professional DVD disc at fast speed. This WMV to DVD converter supports burning your WMV files on all latest OS versions of Windows and Mac system – Windows 10/8/7/Vista/XP/2003 and Mac OS X 10.7 or later. The WMV to DVD Converter supports all major file types and formats including WMV for DVD creation. · Supports burning WMV and WVM to DVD disc, Blu-ray disc, DVD folder, and ISO image.
. Built-in video editor to trim, crop, cut, add watermark and perform other editing functions to WMV videos before burning.
. Choose from 100+ free DVD menu templates to create professional looking disc from WMV videos. 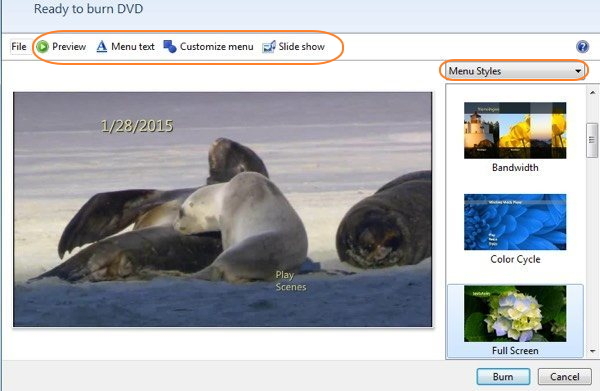 · Customize DVD menu with features like adding a background image, music, changing buttons, creating additional chapters and frames of DVD menu.
. Extra toolbox to convert DVD to DVD, DVD to video, Blu-ray disc to video, burn Data disc, burn ISO to DVD, and others.
. Set video aspect ratio depending on the player screen size.
. Convert WMV videos to DVD with real-time preview, super fast burning speed, and high-quality output. Step 1 Run WMV to DVD converter and choose to create a new disc. Once Wondershare DVD Creator is downloaded and installed on your PC, run this WMV to DVD converter. A window like below will appear. Select Create a DVD Video Disc. Step 2 Import WMV files. To browse and add WMV files from your PC, click + button from the Source tab. You can also drag and drop the WMV files to the interface directly. The added videos will appear in the left column as thumbnails. Step 3 Edit WMV videos (optional). The added videos can be edited for personalization. Click the pencil icon to open the Video Editor window. Select from Crop, Trim, Effect, Watermark, Subtitle tabs and make the changes. Once done, click OK to confirm. Step 4 Select DVD menu template and customize it. Go the Menu tab from the main software interface. The template designs will be shown on the right column to choose from. For changing aspect ratio, adding background image or music, creating new chapters, and other menu template customization, the icons are present at the top of the interface. Step 5 Preview and burn WMV file to DVD. Click the Preview tab to finally check the created disc for WMV file to DVD. Next, move to the Burn tab and a Burn Settings window will open. Select the Burn to disc option, enter DVD label and choose TV standard, folder path, playback mode, and burner. 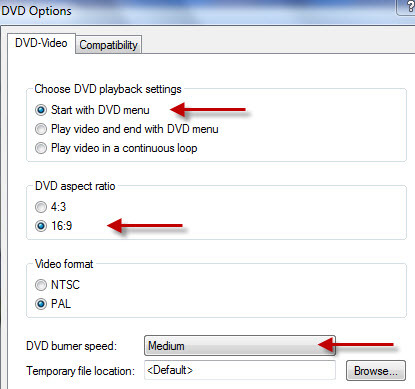 Click the Burn button to convert WMV to DVD player format. If you have Windows Vista or Windows 7 installed on your PC, then you can use Windows DVD Maker as a free WMV to DVD converter. Developed by Microsoft, this DVD authoring program allows creating DVD videos and slideshows for playback on DVD player as well as other media devices. A number of video, audio, and picture file formats are supported by Windows DVD Maker including WMV. A number of DVD types are supported by the program like DVD+R, DVD+RW, DVD-R, DVD-RW, and DVD ROM. Step 1: Open Windows DVD Maker on your Windows PC. A launch page will open. Click “Choose Photos and Videos” to start the process. Step 2: At the top menu, click on “+Add items” button to browse and add WMV videos to the program. Multiple videos can be added here and you can also drag and drop the files. Click the Options button on the bottom-right corner to set DVD aspect ratio, burner speed, video format, and temporary file location. Step 3: Once all settings are done, click Next. A page showing Menu Styles on the left column will appear. Choose the desired menu style. You can customize the menu or change the menu text as well. Step 4: Click Preview to check WMV videos to DVD disc as to how the disc will look. 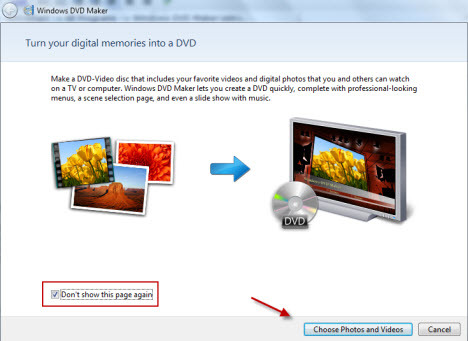 Step 5: Finally, click Burn to start burning your WMV videos to a DVD disc. Video files: .asf, .avi, .dvr-ms, .m1v, .mp2, .mp2v, .mpe, .mpeg, .mpg, .mpv2, .wm, and .WMV. Audio files: .aif, .aifc, .aiff, .asf, .au, .mp2, .mp3, .mpa, .snd, .wav, and .wma. Picture files: .bmp, .dib, .emf, .gif, .jfif, .jpe, .jpeg, .jpg, .png, .tif, .tiff, and .wmf. While using Windows DVD Maker, you can burn your WMV and other videos to only DVD discs. There is no support to burn your files to Blu-ray disc or ISO images for future disc burning. Windows DVD Maker comes with menu styles to choose from but the options are limited. The customization options are also limited as compared to professional programs. There are no advanced options like creating new chapters and others. Windows DVD Maker is available only on Windows 7 and Vista version of the OS. The software is not compatible working on Windows 8, 10, and other versions. If you don't have high request about the DVD burning quality and speed, you can try the following 2 free WMV to DVD Converters to burn WMV to DVD free. This software helps to convert WMV to DVD free on Windows 10/8.1/8/7 and also lower OS versions. Without any ads or extras, the software is clean and safe to install and features multilingual and simple to use interface. A number of formats in addition to WMV like MP4, MOV, FLV, MOD, 3GP, and others are supported for disc burning. There is an option to select DVD menu and also customize the same by adding background music and other functions. 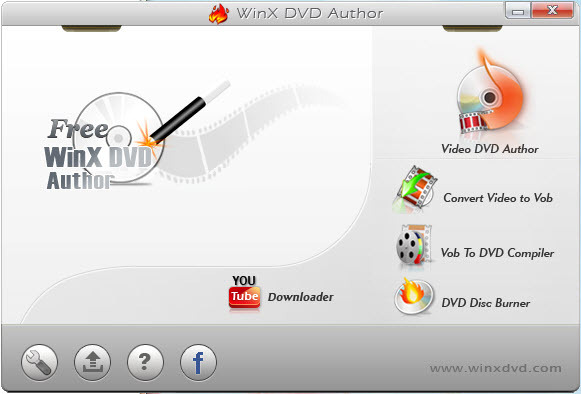 WinX DVD author also allows inserting external subtitles and facilitates YouTube video downloading. To convert WMV to DVD format free online, Zamzar is a good choice. This is a popularly used program that allows converting a number of file formats like FLV, MP4, MOV, WMV, AVI, and others to DVD compatible formats. The interface is simple to use where you can simply drag and drop the files to the program, select DVD as output format, and enter an email address. As the process starts, your WMV files are converted to DVD compatible format and its download link is sent to the mentioned email address. Zamzar does not burn your videos to DVD disc, but rather convert them to a DVD compatible format and thus there is no option for menu template selection or customization. Option for video editing is also not there. The number of video, audio, and picture formats supported by free desktop or online tools is limited as compared to a professional program like Wondershare DVD Creator. Thus while using free software only a few video types and formats are supported for WMV to DVD disc burning. There is also a limitation to the OS and the versions supported by the free tools. Majority of the free WMV to DVD converters do not have an option for DVD menu template designs and its customization. Even if menu styles are available, the options are very limited. Features like creating new chapters and others are also not supported by the free converters. The WMV to DVD conversion speed of free converters is slow as compared to professional software. Video editing features like trimming, cropping, and cutting, adding text, adding watermark, and others are either not present or very limited in free programs. Thus there is lack of complete video personalization before burning in free converters which is not the case with professional tools. Professional DVD burners come packed with additional features like high-quality DVD conversion, option to select aspect ratio, real-time preview, ISO image burning, Blu-ray disc support, and others which are generally not present in free converters. Considering the limitations of the free WMV to DVD converter, it can be concluded that professional software like Wondershare DVD Creator is the best choice for getting the quality disc from your WMV as well as other video files. Install the software and enjoy seamless DVD burning process with high-end features. If you want to burn other formats videos to DVD , you could click here to know more!